Much to the astonishment of the 4-yr.-old boy in my carpool, I picked up the kids from Tai Kwan Do on my bike. My son merely rolled his eyes, a gesture that was directed at either me or his friend. I’m hoping the latter. “This will be fun,” I said and squished him into the trailer, next to my baby, while my other son climbed up into the bike seat at my rear. “This is not fun,” moaned our guest. Over and over. I wasn’t so sure about the “fun” either as we got started. It’s one thing to pull my two kids down the McCormick path. It’s a whole new challenge to add another 50-lb. kid. But the truth is, when the weather gets nice outside, my minivan suddenly feels like the two-ton gas guzzling behemoth that it is. 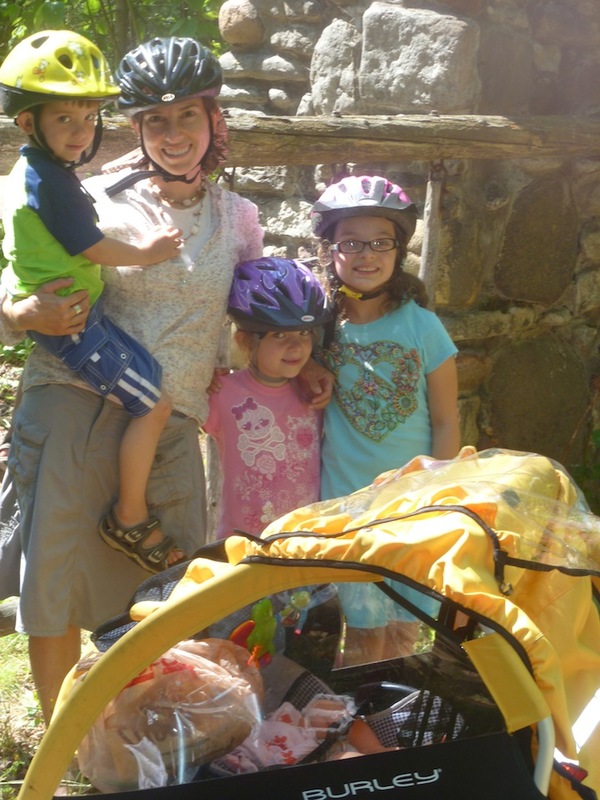 Biking–even with whining, heavy kids packed in back–always seems more appealing than driving my car. Besides, I think I won over our carpool friend by the end of the route. We counted butterflies (33), saw one bunny and two geese with their goslings. “Bet you never saw that from your car,” I said. I got the last word. For biking with young children, there are two options: a seat or a trailer. I have a rear seat and a trailer. However, I prefer the trailer because it’s safer and easier to pull. If the bike tips, the trailer remains upright. The seat also throws off the balance of the bike, though it doesn’t take long to get used to it. A handlebar seat probably is better for balance, but you’d have to be taller than me for that to work. As far as trailers go, the Schwinn from Target works fine, but don’t count on it to last more than a year if you use it heavily. The best bang for your buck is the Burley Bee. We like our Cougar by Chariot – we got a decent deal on sale plis REI dividend. what about helmets? also how do you have the strength to peddle all that weight? wow you are an inspiration! !